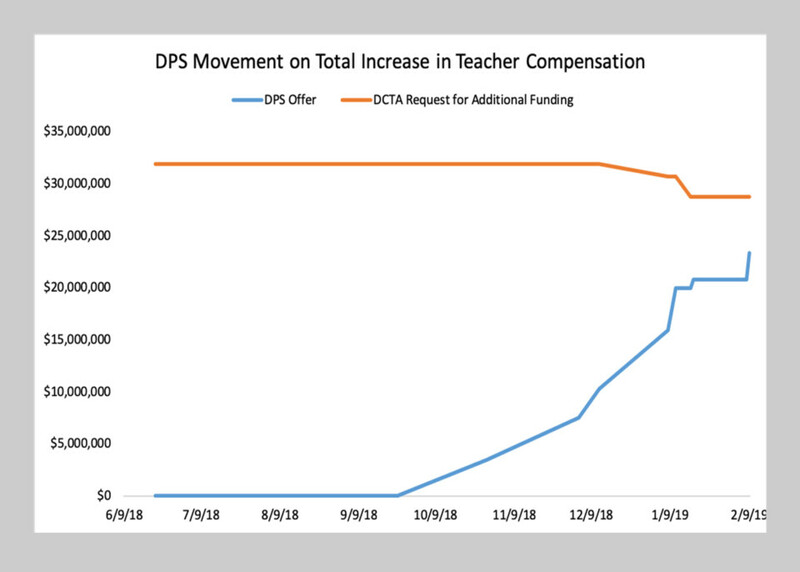 Denver – Denver Public Schools’ (DPS) officials met again at the negotiating table with the leadership of the Denver Classroom Teachers Association (DCTA) on Saturday. DCTA leaders rejected the new DPS offer, walked out on negotiations and indicated they will not return to the table until Tuesday. DPS offered an additional $2 million investment in base pay for teachers and specialized service providers. Money for this will come from the elimination of an estimated 150 positions in the central office. The offer also includes an increase in incentive pay for educators who teach in schools with the highest poverty rates, revisions to how pay increases based on professional development and the elimination of performance bonuses for central office senior staff. The district’s bargaining team will return to the Acoma campus on Sunday to bargain, and invites DCTA leadership to keep talking. This offer brings a total investment of $23 million in new funds next year going directly into teachers’ base salaries, and a total investment of $55 million over the next three years. The proposal provides educators with an almost 11% increase in their salaries next year, with the average teacher salary increasing from about $55,000 to $61,000 next year. Despite significant movement by DPS to seek agreement over the last several month, DCTA leaders rejected this offer. All DPS schools will be open and operating on regular schedules with the exception of Early Childhood Education (ECE) classes, which will be canceled for the duration of the strike. ECE families will not be charged tuition for any days that classes are cancelled due to the strike. School-based services for students in grades K-12 will be provided, including school meals, transportation and Discovery Link before- and afterschool programs. During the teacher strike, DPS staff will be at each K-12 campus to make sure students are safe during the school day. The attendance policy on excused and unexcused absences will remain the same. Parents who wish to excuse their child from school are asked to notify their school or the absence will be unexcused. For more information and to access Family Resource Guides on preparing for a strike, please visit teacherstrike.dpsk12.org. You may also call our Family Helpline at 720-423-3054 Monday through Friday from 7:30 a.m. to 5:30 p.m. Help is available in many languages.